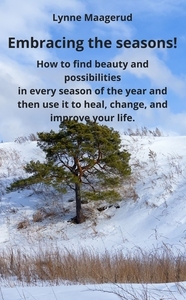 Undertittel How to find beauty and possibilities in every season of the year and then use it to heal, change, and improve your life. A pick me up for you who don't care for that much for the cold season. But since it is coming, you really should take it head-on. Every season of the year is full of joy, beauty, and possibilities. The planet has its set of rules for planning, blooming, changing, harvesting and resting. It is the perfect cycle, and if you move along with the Earth, you can find the perfect rhythm for your life. Planning, organizing and resting during the dark and cold season, changing and setting into action in the light and warm season, and then pulling it all together when you come full circle. We cover all the seasons and the highlights of the year so you can find a way to healing, changing and making a better life for your self. We are all about adjusting to a hectic everyday life so nothing will be complicated and time-consuming.